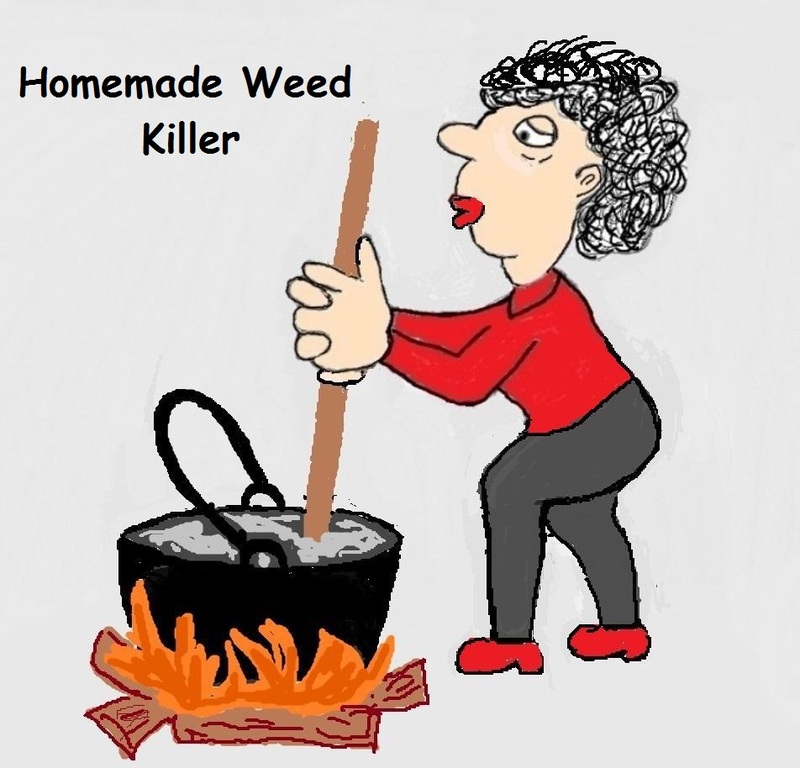 Homemade weed killer is a non toxic answer to a common problem. If you have a yard, you have an endless supply of weeds. And weeding is a lot like cleaning. You put a bunch of effort into cleaning your house or creating a weed-free yard. You step back for a moment to admire your work. Then BAM! An hour later your house is a mess or your yard is weedy. Since you have to spend so much time on both activities, go natural and organic. Protect yourself, your family and your pets from exposure to the toxic chemicals in cleaners and weed killers. And there’s no doubt about it – Weed killers are toxic to more than just plants. Take Roundup, for example. It’s the most commonly used herbicide in the US. And that’s bad because it’s active ingredient is glyphosate. Animal and human studies of exposure have found that glyphosate can affect your health in a bunch of different ways. It's an endocrine disruptor, affects your gut health and is a possible carcinogen. And then there’s that biannual ritual of applying weed and feed products. They contain the toxic pesticide 2,4-D, which was also in Agent Orange. 2,4-D is an endocrine disruptor that interferes with thyroid hormones and is linked to risk factors for acute myocardial infarction and type-2 diabetes. Plus, it’s associated with non-Hodgkin lymphoma in humans and malignant lymphoma and bladder cancer in dogs. So, since you have to deal with weeds, use these three homemade options to protect your health. They’re simple, cheap, safe and effective. YOU are the best homemade weed killer. And by that I mean – hand pulling those suckers out is the most effective way to remove garden weeds. It’s quicker than going around the yard with a bottle of a homemade herbicide, spraying the plants and waiting hours or days for them to die. And it gets the roots out. You just have to arm yourself with the right tools. My favorite garden tool is a Hori-Hori knife. It is an all-purpose weeding tool that makes it easy to get weeds out root and all. The easiest time to pull out weeds is after it rains when the soil is looser. To avoid all the bending try a stand up weeder. A homemade weed killer that prevents weeds from emerging (a pre-emergent) is corn gluten meal. Corn gluten can be used anywhere you don’t want seeds to germinate, including sidewalks and veggie and flower beds. It’s also useful as a weed and feed for your lawn. It can be broadcast with a spreader or by hand. Use in weed free areas like early spring lawns and flower gardens. Weed killing sprays, whether homemade or store bought, are the least effective herbicides. They work best on young weeds, and often require several applications. Plus, if the roots aren’t destroyed, the weeds grow right back. But, based on the research I’ve read, I came up with an original formula that I use sometimes on weeds. The oil-based option will coat the leaves of plants longer, so it is more effective on older weeds. To 1 cup of soybean oil add 11/2 teaspoons (150 drops) of Cinnamon oil, 1 teaspoon of Clove oil (100 drops) and 1 teaspoon of Eucalyptus oil. other plants. Works best in sunny locations and on young weeds. To 1 cup of vinegar add 11/2 teaspoons (150 drops) of Cinnamon oil, 1 teaspoon of Clove oil and 1 teaspoon of Eucalyptus oil. Mix well and place in a spray bottle. Spray directly on weeds. Avoid over spray onto other plants. Works best in sunny locations and on young weeds. Let me know which homemade weed killer you try and how well it works for you. I see lots of forum, blog and social media posts suggesting salt to kill weeds. Bad, bad, bad idea. Don’t do it. Dissolved salt can travel downward into the groundwater or sideways into other areas of your yard. When plants absorb this salty water they will dry out and die. If you use salt a lot as a herbicide you could create dead zones in your yard.